When it comes to honing your physical fitness, it pays to focus on sports nutrition and dieting to fuel your body with the energy and nutrients it needs to maximize your gains. Professional athletes, health and fitness fanatics, and regular citizens can all benefit from receiving the proper nutrition support their bodies require for any level of physical activity. Supplying quality sports nutrition can enhance your performance and deliver more energy, but the debate still continues as to how this nutrition should be delivered. North Carolina residents who are looking to take back control of their lives by building strength and confidence through personal fitness and quality sports performance in Cornelius can benefit from working out with Precision Fitness. Our fitness coaches strive to deliver a comprehensive approach for health-seekers of all types, whether you’re a resident looking to lose weight, an elderly citizen hoping to increase flexibility and mobility, or a professional athlete in need of corrective exercises. We will work with you to develop a personalized fitness plan to achieve your unique goals. Our comprehensive approach to nutrition support, for example, focuses on addressing physical issues, genetic drawbacks, and more. 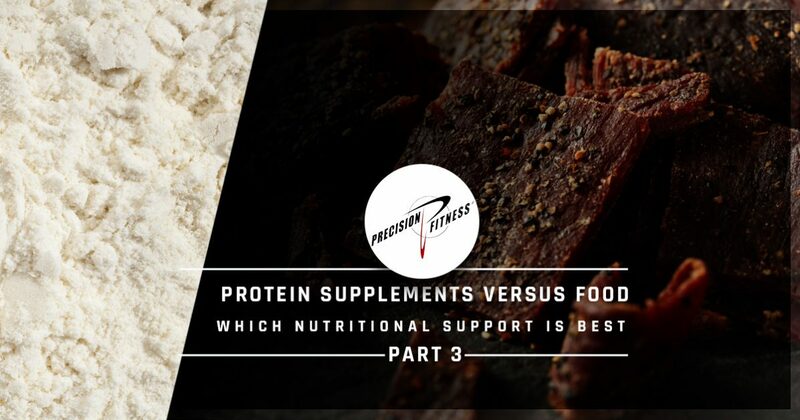 Today, we’ll continue to discuss the contest between protein powders and proteins derived from food. When done, be sure reach out to our fitness team to begin transforming your life! We can start by stating that most protein powders hold very low levels of fat. High-protein foods, on the other hand, can be added and subtracted to your meal as needed to deliver the fat content you are looking for. Fitness fanatics who are looking to minimize their fat intake can opt for the powders while other health aficionados can benefit from the synergistic benefits delivered by dietary fats in delivering energy and supporting optimal cell growth. Your choice of which protein source to utilize may depend on your required amount of fats for your specific goal. The question now is, “Which protein source will help me the most?” Our answer is simple — it depends. Each option provides its own set of unique benefits and drawbacks. If you are looking for a quick concentration of protein to power you through a workout or for optimal recovery after hitting the gym, protein shakes are a smart choice. They also are much more convenient than cooking, giving busy fitness seekers the ability to stock up on protein on the go. It is important, though, to remember that protein supplements are called supplements for a reason. Products such as protein shakes help deliver energy and support for muscle growth, yet they fail to deliver the nutrients that come from a full meal. The protein delivered from food also has a higher thermic effect, burning a percentage of the calories consumed in order to digest and absorb nutrients. The best practice for you may be unique from anyone else’s methods for optimal health and fitness. Precision Fitness is proud to be your source for quality nutrition support, fitness coaching, and sports performance training in Cornelius. Our comprehensive approach to fitness involves holistic practices combined with modern advances. Contact us today to see how we can help you to transform your life!